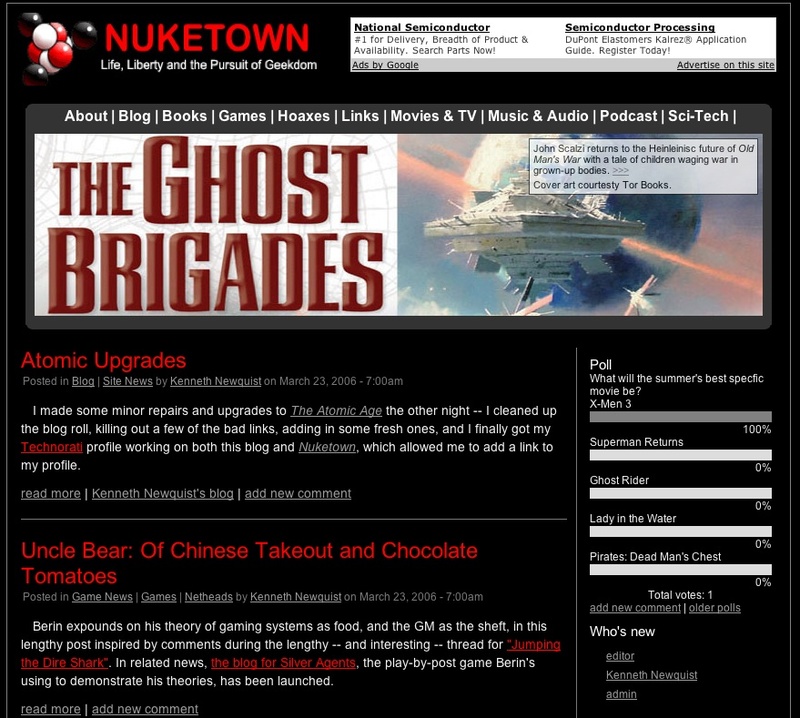 The Nuketown redesign picked up pace this weekend as I finally sat down and focused on it for a couple of hours. In the process I wrestled the new site’s visual design into place, ending up with a fusion of the current blog-like look and the experimental magazine-still site I was playing around with. If you’re curious, you can check out a JPEG of the current beta. The new site echoes certain thematic elements from previous versions — the atom logo by GreenTentacles is still there, and the color scheme — white, grey, red, black — reinforces it while at the same time evoking some of the earlier designs. There’s a lot of work to be done, including scrapping my scripts for exporting data from Nuketown’s existing database and starting over again. The scripts were working well, but the latest version of the content management system I’m going to be using — Drupal 4.7 — has significant changes in the database structure from its earlier 4.6 iteration. With any luck, that shouldn’t take more than a night or two of work. Another bugaboo is the primary navigation scheme, which is always problematic with Drupal. I want the navigation to “follow” the user through the site, so they always know what section they’re in. Drupal doesn’t do that out of the box, but there are some new modules for 4.7 that may do the trick, and if all else fails I can always write script to do it. The final challenge is resolving the conflicts between my style sheet and Drupal’s — for the most part, everything is fine, but I occasionally run into pages where black text is rendered on black tables, which makes things … challenging to read. Once all this is done I need to setup a clean install of Drupal 4.7.x, install the modules I want to use, and get the whole mess running on my new hosting service. That last bit could prove to be the most difficult — it all depends on how friendly their customer service department is. So what’s the ETA on all this? I’m not sure. My initial goal was to have it done by the end of June, and I think I might still make that (though of course the arrival of Baby Nuke #2 will throw whatever plans I make out the airlock). At the very least, I’d like to have the beta live on the test site by the end of next week, and then spend the following week squashing any lingering programming bugs and hunting down the inevitably content formatting issues. My best guess at this point is that the new site will be up by Independence Day, which will be a nice way of celebrating Nuketown’s 10th anniversary.